Proudly meat free. Satisfyingly simple. Ready to eat. High in protein and fibre. 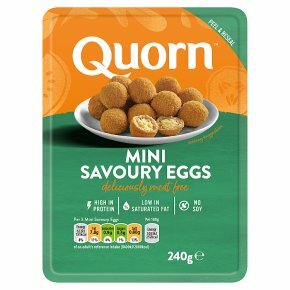 Vegetarians Society approved.Our Mini Savoury Eggs are ready to eat. Appetisingly easy, and a favourite with all the family, these vegetarian snacks are great for lunchboxes or picnics. Ready to eat. If you choose to cook them, simply remove all packaging.Preheat oven to 200°C/Fan 180°C/Gas 6. Place on a baking tray. Cook on the middle shelf for 12 minutes. All appliances vary, these are guidelines only. Check product is piping hot before serving.